DCO scientists continued producing exciting scientific results this month, including a possible solution to Earth’s missing xenon paradox. DCO members Alexander Goncharov, Hanyu Liu, Sergey Lobanov, (Carnegie Institution for Science, USA) and colleagues experimentally demonstrated that xenon, a noble gas, combines with iron and nickel at pressures and temperatures representative of Earth’s core. A paper in Proceedings of the National Academy of Sciences by DCO Deep Life Community members Fengping Wang (Shanghai Jiao Tong University, China), Mark Lever (ETH Zurich, Switzerland), and Kai-Uwe Hinrichs, (University of Bremen, Germany) sheds new light into the cycling of one of Earth’s most abundant biopolymers in anoxic marine sediment, with lignin as an energy source and bicarbonate as a carbon source. DCO’s Deep Earth CArbon DEgassing (DECADE) initiative convened a workshop in Washington DC earlier this month, and calculated new estimates of global carbon dioxide degassing from volcanic sources. DCO’s Carbon Mineral Challenge reported the discovery of two new carbon minerals, ramazzoite and paddlewheelite. Ramazzoite is the first polyoxometallate mineral, which is a mineral that contains a cluster of metal atoms bound together by oxygen. 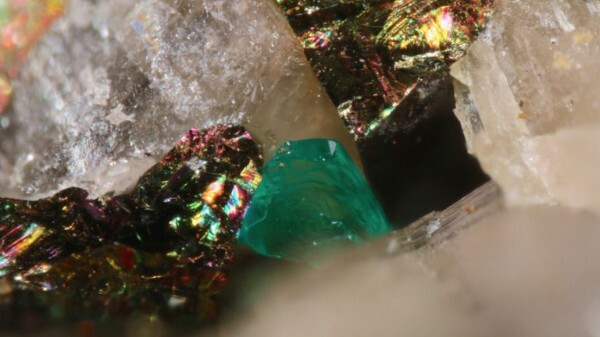 Ramazzoite also is surprising because it contains an unusually large number of negatively charged ions, including phosphate, carbonate, hydroxide, and sulfate. In coming months, DCO will continue to have an active presence at international scientific meetings. In June, we look forward to seeing many DCO scientists at the inaugural Gordon Research Conference on Deep Carbon Science. This biennial conference series could become a sustainable successor to DCO international science meetings and foster international research on deep volatiles for many years in the future. A large contingent of DCO scientists will participate in the 2018 Goldschmidt Conference in Boston, USA from 12–17 August, many of whom are convening sessions and giving session keynote presentations. DCO scientists will deliver two of the five plenary lectures. Fumio Inagaki (JAMSTEC, Japan) will give a plenary lecture on “Exploring Deep Microbial Life In The Planetary Interior: What Are The Limits of Habitability?” Bernard Marty (CRPG, France), president of the European Association for Geochemistry, will give a plenary lecture on “Origin and Early Evolution of Terrestrial Volatiles.” DCO Deep Energy community member Shuhei Ono (MIT, USA) is co-chair of the organizing committee for Goldschmidt 2018. Last but not least, congratulations are in order to Emma Liu (University of Cambridge, UK) for winning a L'Oréal UK & Ireland Fellowship For Women in Science, and to Venkata Srinu Bhadram (Carnegie Institution for Science, USA), who is a recipient of the Carnegie Postdoctoral Innovation and Excellence Award. On a personal note, I hope to see many of you in the months ahead at the upcoming meetings. In this webinar, Mark Parsons (Rennselear Polytechnic Institute, USA) will review various technologies recommended by the Research Data Alliance and how they are being implemented in the DCO Data Portal. 26 May 2018 What Is Kilauea’s Impact on the Climate?